BALTIMORE (CNS) — Archbishop William E. Lori of Baltimore acknowledged the renewed pain and anger caused by clergy sexual abuse following the release of a Pennsylvania grand jury report that details some of the actions taken by Cardinal William H. Keeler when he was a bishop in Pennsylvania. “At this difficult time in the life of the church, we in the Archdiocese of Baltimore are especially saddened and troubled by the news of the late Cardinal William H. Keeler’s failures while serving as Bishop of Harrisburg, one of six dioceses cited in the grand jury report,” Archbishop Lori said in a statement Aug. 14. Cardinal Keeler was auxiliary bishop of Harrisburg from 1979 to 1983, when he became bishop of the diocese until his appointment to Baltimore in 1989. “The cardinal’s 2002 letter to the faithful of Baltimore which accompanied his disclosure of credibly accused priests included words that are even more revealing in light of today’s report: ‘The simple, painful truth is that the church did not go far enough to protect children from sexual abuse,’ the cardinal wrote. ‘I humbly ask forgiveness for my mistakes. Please pray for me so that I may better serve,'” Archbishop Lori said. The 2002 report from Cardinal Keeler made Baltimore one of the first dioceses in the country to release a comprehensive list of names of priests who had been accused of sexual misconduct with minors. The report came just a few months after the U.S. bishops, gathered in Dallas, approved the “Charter for the Protection of Children and Young People” and accompanying norms that required dioceses to implement “zero-tolerance” policies regarding clergy sexual misconduct. “Try as we have, recent revelations have not only proven that there is more work to be done, but also have resulted in the loss of the precious trust of many of those we are called to serve,” he said. He added: “My prayers today are with the survivors and their families, with the faithful of the Archdiocese of Baltimore, and with the many good and holy priests, deacons and religious who selflessly serve in the example of Jesus Christ each and every day in this local church,” the archbishop said. In an interview after Archbishop McCarrick resigned from the College of Cardinals in late June but before the release of the Pennsylvania grand jury report about 70 years of sexual abuse in that state, Archbishop Lori said that when new allegations of abuse by clergy or others representing the church surface, he is certain it opens old wounds. When the abuser is a high-profile member of the church, such as Archbishop McCarrick, retired archbishop of Washington, “I think it wounds even more deeply. It shocks people more deeply. It shakes (victim-survivors) more deeply,” Archbishop Lori said. People in the pews who have not been affected directly by abuse are also shaken by these developments, he added. All Catholics are dedicated to spreading the Gospel, but those evangelization efforts “hinge on the credibility of the church and her ministers,” Archbishop Lori said. When someone as high profile as Archbishop McCarrick is accused of misconduct, it undercuts the church’s credibility in dealing with sexual misconduct. “Trust is a very, very important thing in all areas of life but it is particularly important in the life of faith. … Our efforts to rebuild trust and credibility have been dealt a setback,” Archbishop Lori said. “I think that our faith is not in a particular priest or bishop or other minister of the church, no matter how beloved that person might be,” he continued. On the other hand, those who represent the church have an obligation to be genuinely on the road to holiness, struggle with their own weaknesses and God’s grace, and be credible by striving to live what we proclaim as Catholics, he said. 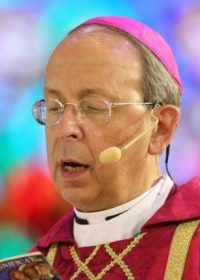 The archbishop said when the sexual abuse crisis in the church came to national attention in 2002 and the bishops passed the “Charter for the Protection of Children and Young People” at a meeting in Dallas, the bishops set as a cornerstone that sexual abuse of a children is not to be tolerated in the life of the church. “One strike and you’re out,” Archbishop Lori said of the zero-tolerance policies passed by the bishops in Dallas. Significant progress has been made in the church since that time, with the establishment of independent review boards, and background checks and training for all clergy, seminarians, employees and volunteers who work with minors. After the grand jury report, the archbishop said he has made the healing of survivors and the strengthening of the archdiocese’s existing child protection efforts a top priority. “Key to our efforts is the strength of our independent review board and our mediation program for survivors of abuse,” he said Aug. 14. “Both of these rely heavily on the independent leadership of laity, which will be integral to the credibility of any effort to advance reforms in the church to bring about greater trust, accountability and transparency. “These are all critical to our ongoing and daily efforts to protect those in our care and to promote healing among those the church failed to protect,” he said. Gunty is associate publisher/editor of Catholic Review Media, the media arm of the Archdiocese of Baltimore.